Your vehicle is equipped with a system which keeps it immobile for a short time (approximately 2 seconds) to assist you when starting on a hill, the time required for you to move your foot from the brake pedal to the accelerator pedal. - when the driver's door is closed. 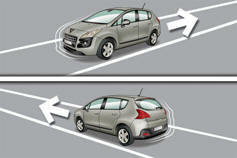 Do not get out of the vehicle during the hill start assist temporary hold phase.